Have you ever noticed how many times water is used to describe a Biblical concept throughout the Word? The Old and New Testament use this metaphor. I’m going to focus today on a few of the ways water is connected to Jesus, the Living Water. Turn to John 1:29-34 and let’s take a look at Jesus’ Baptism. John makes a clear distinction between baptizing (The Greek word here is baptizo and means getting totally wet) with water and the Baptism of the Spirit. Water baptism is obedience to the Lord’s call with a public affirmation of faith. The symbolism here regards the complete washing away of our sin and rising to eternal life from the watery grave. The baptism of the Spirit is what we receive when we acknowledge Christ as our personal Savior. The Spirit completely indwells and covers us, never to leave. It represents us to the world as God’s own. 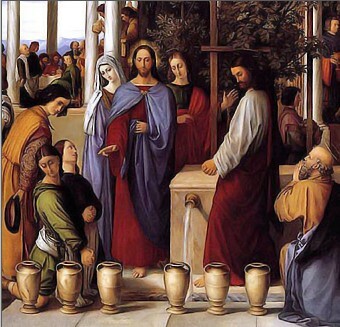 The first miracle recorded in the Word is His turning the water into wine. This account is found in John 2:1-10. Mary tells Jesus the wine has run out. Not a good thing to happen in a wedding celebrations. It would have been very embarrassing because hospitality was a very big part of life in that time. It is interesting that He appears to say no to His mother. In reality He followed through. On the surface of this miracle it would seem that turning water to wine is the main issue. I think Jesus was starting the pattern of signs that would lead to our understanding that He is the Jehovah Jirah, the God who provides. He wanted us to understand that as the Living Water He alone will provide all our needs. There are many water metaphors. Consider Luke 22:10 – You will see a man carrying a pitcher of water….John 19:34 – Water poured out of the wound left by the piercing of His side…Revelation 22:17 – The invitation to freely take the Water of Life. Water is a visible representation of life from Genesis to Revelation. Such a simple commodity, such an eternal function. Heavenly Father, Giver of Eternal Life, I have tasted the Living Water. Give me more. Let me feast at your table…Let me drink of the Water. Make it so! This entry was posted in Bible Study and tagged Baptism, baptism of the spirit, jehovah jirah, Jesus, John the Baptist, Living Water, New Testament, Samaria, spirituality, Water of Life, Water to Wine, Wedding at Cana by Marie. Bookmark the permalink. Thank you Marie, a well thought out message with good detail and I Loved your prayer. Jesus as The Living Water has always impacted my heart with wonder, so I created a Power point ( see link below ) focusing on Him in this light and other Truths that we can hold onto and give thanks for. Anne that was beautiful. There is None Like You is one of my favorite praise hymns. So beautiful! The drought in the environment reflects the drought in Society. Water is the source of all Life. Ann that is so true. Perhaps the Gardener is trying to get our attention.